The Gurudwara Dukh Niwaran Sahib is the site where Guru Tegh Bahadur Ji healed a sick person. 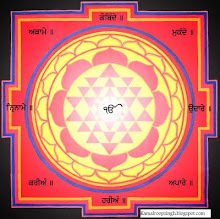 At the time of Akali Baba Hanuman Singh Ji, the next leader of the Akal Takht Sahib and Khalsa Army (Dal Panth - Buddha/Tarana Dal), there was no large Gurughar as we see today. 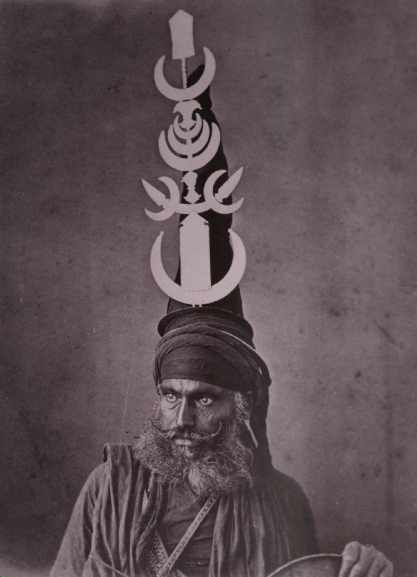 Akali Phoola Singh had attacked Metcalfe previously, and others. Nihang Singh oral tradition states that the East India company sent spies to Anandpur Sahib, in the guise of Priests, to collect information. Akali Phoola Singh became aware, and knew the British planned an attack. He outsmarted the English gentlemen who were very clever and cunning in their strategy. 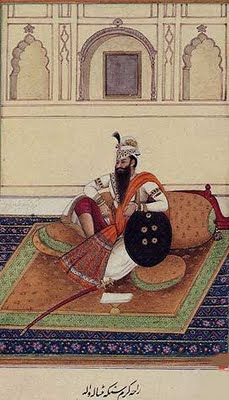 Akali Phoola Singh put siege to a whole regiment of the British Army. All of the men were killed apart from the General, who was told to go back to his leaders and tell them never to set foot into the Punjab. Of course they did as they were invited by Ranjit Singh. Anyhow the British obviously had it in for the Nihang Singh Khalsa after that day. Members of the respected Guru's presence, this is the martyrdom place where the Seventh Jathedar, the great great Martyr General Saint Hanuman Singh, the leader of the Akal Takht, was marytred. His fathers name was Garja Singh and his mothers name was Harnam Kaur. He was born in 1755 in Narangpur. He served the Buddha Dal for ten years. In 1845 the treacherous Gulab Singh Dogra, Tej Singh and the British joined forces to end the true Sikh Kingdom. At that time Maharani Jind Kaur had sent a letter with Sham Singh Attari, to ask the Seventh leader of Buddha Dal (Baba Hanuman Singh) at the Akal Takht in Amritsar, for help. The Leader with the Singhs went to battle. At Modki the Singhs and the British fought, ten thousand British soldiers died. The British army fled. The Buddha Dal (Khalsa Army) reached the Nihang Camp in Patiala, the British had paid off Karam Singh the King of Patiala, they blew up the Nihang Singhs with Canons, 15, 000 Singhs were maryted there. 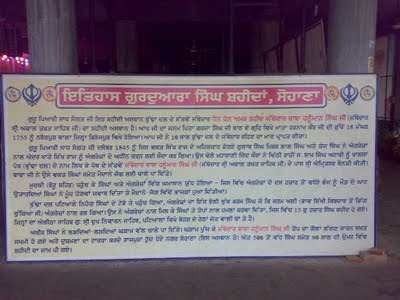 (The Site of Dukh Niwaran Sahib). Left - Gulab Singh Dogra. Below Right - The treacherous Karam Singh. The Nihang Army was pursued by these Malech upto Sohana where another 500 Singhs were Shahid, this is where Baba Ji fell at the age of 90 years old. A drawing of Akali Baba Hanuman Singh Ji: He was 90 years or plus in this drawing. The Gurdwara Dukh Niwaran Sahib, is a place of great sadness for the Panth, where the Kings of Punjab sold out Sikhi, for their British masters. The Gurdwara was built as a memorial to the Singhs who were killed in cold blood, but today the real history of the site has been suppressed. It is sad that the same Kings sell out Sikhi for the GOI, even today.